Well, our house is built and it’s all really beginning to feel like home. Mark was a typical boy, and went exploring one day. He was still really unfamiliar with this country, and I guess he didn’t notice that he was getting too near a cliff. He slipped off and grabbed hold of a rock, hanging on to dear life. Well, there was this gang that had just robbed a bank. Two of the members were brothers and separated from the others in the group. They had agreed to meet back up in Black Springs, where they would split the money. Will and Hank kept the money with them. A posse was after them, and they had managed to fool them. While Hank and Will rode along, They suddenly heard Mark’s cries for help. Actually, he was begging for someone – anyone to help him. Will, the younger of the two heard the screams for help, and him not being an outlaw yet told his outlaw brother that he was going to check on the boy. He ran down the hill and saw Mark hanging over the cliff. Will tried to act like he had a hard heart, but his heart was actually tender and he wanted to help my boy, but his brother told him no. “But that boy might die!” Will exclaimed. “If the posse catches us, we will die.” That was Hank’s answer. As they started to ride off, Mark again pleaded "help me!" Will couldn’t stand it. He was not a killer, and he knew he’d never be able to live with himself if he didn’t help my boy. So, Will disobeyed his outlaw brother and went back to save Mark’s life. “I can’t leave that kid down there!” Will told his brother as he tied the rope around the tree. Will threw the rope down to Mark and told him not to try to climb up, that he was coming down to get him. He did and my boy was saved!!! His brother even offered to pull Mark up. 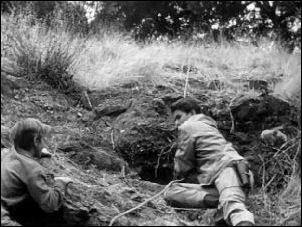 As Will tried to climb up the cliff, however, he slipped and fell. His face shown with signs of pain and his brother ran to the side of the cliff when he heard his screams. Will announced that he had broken his leg. I was back at the ranch chopping firewood. If I had known that my boy was in such danger, I would have been over that cliff in a heartbeat. I heard horses approaching and grabbed my rifle just in case there was trouble. I looked curiously at the strangers when I noticed my son riding on one of the horses. Hank lifted Mark down from his horse and Mark ran over to me, still excited from his recent adventure. "Pa, Pa, I fell off the hill onto a ledge in the canyon. Boy, I could have been a gonner!" I gave Mark my rifle and went to help the boy off his horse. I told Hank that we’d get Will inside, then I’d go for the doctor. I was taken aback when he commanded, “No doctor!” It was then that I realized that these men were running from the law. I looked at Will, and then at Hank. “That’s right,” he stated. After we brought him into the house, I worked on resetting his leg. I poured him a glass of whisky, but he shook his head. I wiped the sweat off my forehead. I admit that I was scared – I had one shot to reset his leg. I knew it would hurt. I did it as fast as I could and Will let out a cry of pain. From the look on my boy’s face, it looked like I was breaking his leg! His ploy worked. I felt responsible for Will getting hurt, so I agreed to let him stay. Hank told his brother that he would go on ahead to Black Springs to meet the others and for Will to keep the money with him. They would divvy up the money when they came back in one month for him. He said, “Don’t worry about the sodbuster. He’s an honest man.” Then they laughed. Mark and I went to do our chores and Mark told Will he was glad we were staying with us. This took me aback a bit, and I gave him a surprised look. Will had a bit of an attitude acting all mean, and Mark asked me what he was so mad about. “I don’t think he knows, son. But he can’t be as mean as he makes out.” Mark questioned me on this and I stated, “Well, if he was, he wouldn’t have stopped to help you.” I said this with much emotion on my voice. I laid my hand on him, thankful he was alive. While working outside, a rider approached the ranch. It was Marshal Bennett from Martinsville. He told me that the bank was robbed a week ago and that he was trailing three men and a younger man about 19. The three men were spotted south of here, and he felt the younger man was holed up somewhere around here. Will had his gun trained on us, so I told him that I hadn't seen them. I went to Will and asked him what he would have done if I had told the Marshall the truth. He tired to act real mean by telling me he would have killed us. I grabbed the gun from his hand and Will fell over. He got angry and told me I wouldn’t have done that if he didn’t have a lame leg. “Oh yes I could, son. And if you don’t think so, try me when you get better!” I answered. Because I care for people no matter who they are, I decided to make Will a more comfortable crutch. He asked me why, and I told him because I thought it might make it a little easier for him. As time went on Will's attitude began to change. He felt more at home and liked it here. He became closer to us and even let Mark ride his chestnut horse, but only because the horse needed exercise, so he said. “All right, I will!” Will exclaimed. Mark got the checkerboard out. “But before you start, let’s clean that table off. Both of ya'!” I ordered, pointing my finger at them. I couldn’t help smiling as I watched them working together. I don’t care what Will said, he wasn’t an outlaw! One day, I was outside working on the wagon. Will came up and told me I was doing backbreaking work. “Anything to do with farming is backbreaking!” Will exclaimed. “Work from sun-up to sun-down trying to make a living. In the end, they steal it away from ya' anyhow.” Will went on to tell me that his parents had been killed when a man named Carlson forced his way onto their farm. He just stood there and told me the same thing would happen to me. I could tell he had a lot of bitterness inside him and needed some tough love. I asked him who had told him that someone always steals what you work for away from you, and he started telling me things his brother told him. That was enough. It was time to put his brother in this rightful place. Will was still trying to convince me that they had it so much rougher. I wasn’t going to allow him to keep thinking that the whole world was bad just because they had a tough experience. “Only a fool or a child would reason that way!” My words had the right effect. Will stomped off, knowing I was rig ht. I couldn’t resist smiling, knowing that he would think a lot about what I just told him. Later, I was chopping firewood. Will came to watch, and I could tell he needed to see that he could be a farmer again. So I made an excuse about having to go check some stock. Again, my plan worked like a charm. After I was out of sight, Will got to work on chopping the wood. While doing so, a woman by the name of Ann Bard had come to invite me for dinner on Sunday. She and Will smiled at each other and she told Will she’d probably be riding past my ranch again. After she left, Will had a smile on his face and chopped that wood joyfully. I sat at the table and listened to the whole conversation. It was then that I knew that Will had changed – he no longer wanted his brother to come back. And I think maybe my boy learned a little something from his speech. Will was outside making a boa one day and told Mark to do his chores and he’d call him when it was done because he was making it for him. I think it pleased them both. While my boy was doing his chores, Ann rode back up and invited him over for supper on Sunday. Will hesitated, knowing his brother would be coming any day. “I can’t,” he stated. She asked about the Sunday after that. “No, I’m sorry. I can’t.” Suddenly, Ann got the feeling that he wasn’t interested in her, so she stated that she wouldn’t be riding out that way anymore. Will started to tell her something, but simply said goodbye. Mark came up to him while he was feeling sorry for himself. When Mark asked him if he was all done with the boa, Will said “Yea. I’m all done. Here, take it!” Mark just stared at him. He didn’t understand what had suddenly changed his mood. “Well go on, pick it up,” he yelled. My boy was very sensitive to how people felt about him, so he hurried off, upset. Will realized that he had taken his frustration out on Mark and ran after him. He begged Mark for his forgiveness. I had watched the whole thing from the house and wanted to tell Will a few things, but didn’t want my son involved in the conversation. So I sent him inside. “You know what’s wrong with you? You want to quit that bunch but your afraid to admit it to yourself. You know why? Because you’ve had a taste of re al life and you like it. You met a girl you may be in love with, and you probably even have a notion about settling down.” There – I laid it all out in black and white for him! “That’s easy son,” I stated. “When they come for you, just tell them you’re through.” Will was a hard one to convince and he just stated that I didn’t know his brother. I know that he thought it was possible, but I’ve been watching his heart since he arrived, and I knew everything in his heart wanted to stay. I also knew I would stand beside him and make sure it happened. Well, the day was bound to come, and it finally did. The three of us were out by the fence working when Mark saw some rider’s approaching. Will stated it was his gang coming to pick him up. It was Mark that asked the question. All three of us wanted to know the answer. I turned and looked at Will, who stated “I don’t know.” But I knew. I knew there was only one answer. “Get inside, Mark,” I ordered. Mark started to question me, but I didn’t have time to explain. “Do what your father says!” Will ordered. Mark did as he was told. I guess Hank didn’t like the tone of voice. He told Will he could tell him later and to get his horse now. “No,” Will stated. From the tone of things, it sounded like that was the first time he ever had the courage to say that word. Hank wasn’t happy. The other members of the gang told Hank to just take the money and let him go. So Hank ordered Will to give him the money. I watched Will as he started forward with the money. I reminded him that the money belonged to the bank. I could tell that Will wasn’t strong enough to stand up to his brother, so as Will stretched out the saddlebag, I grabbed it. That’s when it happened. There were several gunshots. It all happened so fast. I got off some shots and Will got off one too. When it was over, all three of the gang members were dead – including Will’s brother. Will was sad that it had to end this way. Will left for Martinsville the next day to turn himself in. I trusted him to do the right thing, so I didn’t go with him. Will knew he would no longer be an outlaw again. He said his goodbyes and asked Ann to wait for him. And that was the end of a young gun. Who shot who? At the end of this episodes, three outlaws were killed. But who shot who? How many did Lucas shoot? How many did Will shoot? Battle Within a Young Gun by Frank Charles. piddlin' stuff...There were a number of well-known guest stars during the first season, many of them to go on and have shows of their own. 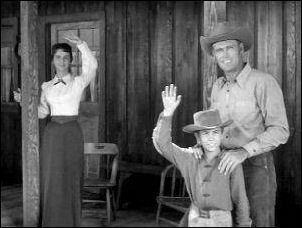 Michael Landon who appeared in End of a Young Gun as Will Fulton and The Mind Reader as Billy Mathis. In which three episodes do we see two of the 'Cartwright boys?' 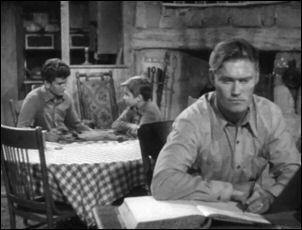 There were five actors who appeared on "The Rifleman" that were regulars on Bonanza — do you know who they are? Charles Cooper played Will's older brother Hank Fulton in this episode of End of a Young Gun. He also appeared as Rudy Crofts in The Stand-In' he was the prisoner who escaped ― Matt Yordy in Honest Abe, he was the man who kept picking on Abe ― Larsen the bartender in I Take This Woman. Joe Haworth appeared two episodes ― End of a Young Gun as Marshal Bennett from Martinsville who was looking for the bank robbers ― The Grasshopper as Davis, one of the men on the train. Mel Carter appeared in eight episodes ― End of a Young Gun as an outlaw, he rode with Hank Fulton ― The Safe Guard as Walkerman, one of the guys who help rob the bank ― The Challenge as a cowhand in the saloon ― The Woman as Jed Healy, the one who shot his Pa ― The Journey Back as Arnie Grady as one of the brothers that Will Temple threw off his ranch ― Outlaw's Shoes as Jeems, he was George Vale's partner and the one who shot Lucas and grazed him in the head ― Lou Mallory as Bo Jackman ― Death Never Rides Alone as Mark Jones. Gee.....does this set any records? Carolyn Craig as Ann Bard, the girl who is waiting for Will's return.